Since 1998 Lunarpages has claimed to be a company offering IT solutions for different enterprises and also a web hosting provider offering its hosting solutions for personal and small business projects. Lunarpages state that they create and manage hosting tools that match perfectly in what comes with building and designing websites, their optimizing and marketing. According to the company, they serve over 150,000 customers. 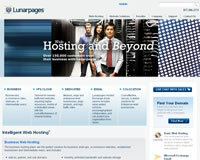 Lunarpages provides a variety of hosting solutions for both beginners and higher-end users. Among them are starter and basic plans, windows hosting, Linux and Windows vps hosting, business hosting, dedicated hosting. The company is also known as a reseller web host sharing its ideas for advanced individuals who wish to run their own hosting company. Lunarpages is honored as a leader in the web hosting industry and probably this is due to their high-class hardware, award-winning service and technical support 24/7/365, complete hosting solutions with a number of tools to launch and run a website. Lunar Pages also provides many electronic payment options. Hawthorne, California data center – provides with a multi-tiered, reliable, controlled and secure environment for the customer servers. Irvine, California SAS 70 Type II compliant data center – supplies fully redundant power with diesel generators for backup, multi-tiered security services. Las Vegas, Nevada data center – intense secure with key card access, Mantraps, 24×7 security monitoring, local police, SAS 70 Type II audit certification. 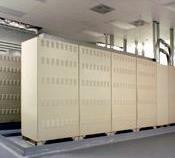 San Diego, California data center with over 80,000 sq.f. – has Tier 4 certification, advanced technological security; SAS 70 Type II audited. As been mentioned above Lunarpages provides a good choice of hosting plans developed for resolving different tasks. Their most popular offer is Basic hosting plan – it includes a number of basic options and is meant for personal and small to medium businesses, web projects, blogs. The avaliability of DDoS Protection should be the Plan’s important feature. This kind of protection is a complete solution for the server which assures that a customer’s website is well-protected against server potential attacks (DDoS attacks). Windows hosting plans focus on active server pages, staging environment and informational websites. VPS web hosting packages should meet Linux/Windows users’ hosting demands as well as the ones of developers and proficient users. Choosing their Quicksite™ as a special offer a customer is supposed to get from Lunar pages a ready website within two hours. Lunarpages establish themselves as a leading hosting provider with an experience in the industry over ten years. Their technological solutions are aimed at novice and advanced users, start-ups, established and enterprise-level businesses, e-commerce owners. The variety of Lunarpages hosting plans and tools would allow to choose the best web hosting program to fill the customer’s requirements. A noticeable feature included to Lunarpages hosting services is DDoS Protection that allows to prevent hack attacks and keep customers’ servers running safe and secure. Lunarpages offer a wide choice of payment methods. The services can be paid by credit/debit cards (Visa, MasterCard, American Express, Discover), by check/money order, by Electronic Check, or by PayPal. Also there are alternative payment options and a customer can choose what is more preferable: Pay By Cash (through the mail), Western Union, CertaPay (Interac), e-Gold, Paysafecard, NETeller or WebMoney Transfer. Facebook Ads credits + Google Adwords credits. Below you can read LunarPages reviews submitted by our site visitors who were (or used to be) LunarPages customers at the time of writing the review. I’m happy to have this opportunity to tell you how much I appreciate the excellent support I received from the techs at Lunar Pages. I am a 67 year old artist, unknowledgeable in web development. In the past, I have sold my etchings through galleries. My sales generated enough income to support my paraplegic husband, who is also on dialysis, and myself. I have taken care of him for 28 years, 24/7. My art market has taken a plunge with the galleries going broke. I choose the Allwebco template because it is classic and fits my media beautifully. I had no idea how big the gap was between my wants and my abilities. This is my website: coppocketchings.com I have some gaps and empty image slots, but I think it’s going to fit my needs beautifully. Sincere thanks to everyone at Lunarpages. I have been with lunarpages since 2010, starting with a VPS (Virtual Private Server) account. From the start, the staff at Lunarpages has always made me feel at ease, especially back when I knew one hell of a lot less about hosting than I do now. My switch from another hosting company to Lunarpages was necessary because I needed to upgrade from shared hosting to a managed VPS, and my original hosting company didn’t offer managed hosting. As much as I like to learn new things, learning to manage my own server was not something I had the time or interest in pursuing. So, I made the switch to Lunarpages based on a friend’s recommendation. He told me that he had been hosting his site with Lunarpages for years and that he was very impressed with them. I made the jump, and although I was still unsure about this new world of VPS (and later dedicated hosting), the entire crew at Lunarpages had my back the entire time. When an issue popped up that was beyond my comprehension, a quick call either got the issue explained and resolved, or it set the wheels in motion to get the issue handed in a timely manner. Eventually I realized I would need a dedicated server and made the upgrade. Again, the Lunarpages crew was there helping me, sometimes when I was frantically calling them in a panic over one thing or another, but always, and I say this with absolute conviction, ALWAYS, the staff at Lunarpages were there to take care of business to ensure my server worked – and works – properly. I am, by no means a server guru, nor an elite skilled webmaster, so it’s always a good feeling to know that if I’m in a bind over something server related, Lunarpages is there to help. I have recommended them to many people over the years and I continue to do so. Their service, support and products have kept me a happy, loyal and enthusiastic Lunarpages customer. When the time comes to add another server for my business, I’ll be getting it from Lunarpages. We have used lunarpages for basic email for some period of time based on a shared server environment which has provided a low cost email entry point. The reputation of the server has caused mail to be rejected by one of our customers. After reviewing our options we decided to upgrade to an exchange server based mail system for our more important accounts. This required a split domain. Received good support through the transition, but especially from Brain Lemos who invested significant time to ensure that the overall system worked end to end. I am not pleased that the switch required the degree of complexity that it did, but the customer support provided helped to smooth the transition out. Many Thanks to the staff at Lunar Pages – specifically now at the Managed Share Hosting Dept.! My web site has been hosted by Lunar Pages since 2002. The site has always run smoothly, never been down (as far as I know!)! Now, I have begun using the Managed Share Hosting Dept. I am absolutely delighted! The staff have gone out of their way to help me and accommodate my specific needs. They are fast, responsive, and have provided me with exactly what I needed. The price is also reasonable! And they will talk to me on the phone when necessary! I was feeling stuck – I designed the site in graphics over 10 yrs ago but the programmer was slow and horrible at communications whenever changes were needed so I rarely made any – I desperately needed to update the site. More needs to be done, which I now trust them to do when I get it ready for them! Meanwhile, I am so grateful for the work that has already so quickly been taken care of – BRAVO! We’ve been with Lunarpages now for a while and finally feel confident in a web host. In fact we’re moving our whole business over to Lunarpages currently. The amount of business we do and the need for zero downtime is crucial and they have made us feel confident. The times I have called to ask questions I’ve always had an understanding and helpful person on the phone. We we’re so tired of reaching email quotas and reaching maximum disk space and now that’s a thing of the past. We’re happy to give them our business! I have been with Lunarpages over many years. Recently a website that I was running went into overdrive and breached the resource usage limits. Lunarpages did not immediately take it off line but sent me a message and suggest managed hosting whilst we worked on the problem. The peak usage went upto 15% of total server capacity. They suggested and implemented various changes as did I. Together we eventually resolved the major performance issues which were causing some of the problems. Not all, as they were due to vastly increased usage. I would like to say how satisfied I was with their service and the professionalism of their staff. My first time using Lunarpages for web and hosted Exchange, The sales team has gone above and beyond to make sure everything I needed was implemented correctly. I would like to say how extremely impressed I’m with the service and support, especially with the follow up. I am a customer of Lunarpages from 2004. Their services and support was beyond any other hosting I have ever tried tried. It is a great pleasure working with Lunar Pages. They probably offer one of the best hosting services on the planet! I have used several hosting companies since the late 90’s, but have been with Lunarpages now for a number of years, starting initially with a VPS, but now with a dedicated server for several years. I am so happy with Lunarpages and their service. The server never goes down. I’ve learned to become a fairly good html programmer, but know little about configuring a server and all the back-end stuff. Lunarpages handles all of this stuff for me very promptly. I don’t need to contact them very often, but when I do, they respond to my help ticket usually within an hour. On phone calls, the wait time is very short, if at all. Lunarpages is a great company! In my experience, the best thing about Lunarpages is their responsiveness. You can get web spaces million different places, some cheaper. But immediate response and obvious effort are much harder to come by. I’ve been with them for years and expect to stay for more. I hosted my first site with LunarPages in the early 2000’s and now manage about 15 sites on their servers, ranging from Basic to Enterprise accounts. I rely on them for their excellent tech support with Managed Shared Hosting, which is a great value, not only for problems outside of my skill set, but also for simple tasks that free up my time for managing my business. I’m prompted to write this review now, due to the consideration that Randy in their billing department gave to one of my nonprofit clients. His kind words about their mission and the special allowance he made for their hosting plan was much appreciated. I know that I am a valued, long-term client when LunarPages goes out of their way like this for one of my clients. I have been with LunarPages since May of 2007, almost 7 years. They were a dream come true for me after having tried to run my own set of servers in my closet in my home for 8 years! They manage my servers, they fix hacks, they fix backups, they fix everything in a timely manner for me. I would not be in business without them!